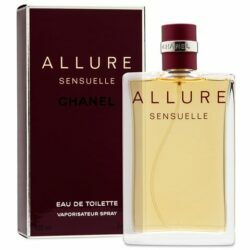 Allure Sensuelle Eau de Toilette is described as a modern, magnetic scent which represents a lighter and more refined way to wear this perfume. Floral – oriental, bright and spicy, it reveals fascinating layers of female attractiveness. Available as 50 and 100 ml Eau de Toilette. Allure Sensuelle Eau de Toilette was launched in 2006. The nose behind this fragrance is Jacques Polge.